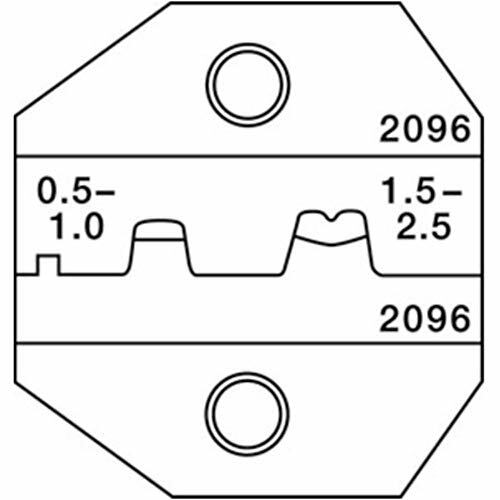 Superior Tool 2701 Enclosed Die Head, 1"
HHIP 12 Piece 1/8-1" NPT Taper Pipe Tap and Hex Die set includes one of each of 1/8-27, 1/4-18, 3/8-18, 1/2-14, 3/4-14 and 1-11-1/2 NPT tap and dies Thread ground high speed steel. Right hand. Supplied with solid wooden case. Thread ground high speed steel. Supplied with solid wooden case. 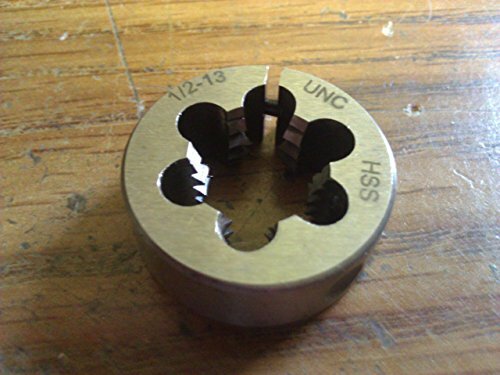 Includes one of each of 1/8-27, 1/4-18, 3/8-18, 1/2-14, 3/4-14 & 1-11-1/2 NPT tap & dies. 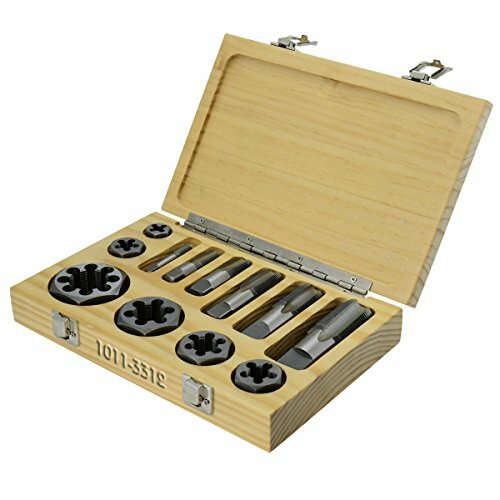 HHIP 16 Piece 1/4-3/4" Hexagon rethreading die set includes one each of a 1/4-20, 1/4-28, 5/16-18, 5/16-24, 3/8-16, 3/8-24, 7/16-14, 7/16-20, 1/2-13, 1/2-20, 9/16-12, 9/16-18, 5/8-11, 5/8-18, 3/4-10 and 3/4-16 die. It is made of carbon steel. Right hand. Supplied with fitted metal case. 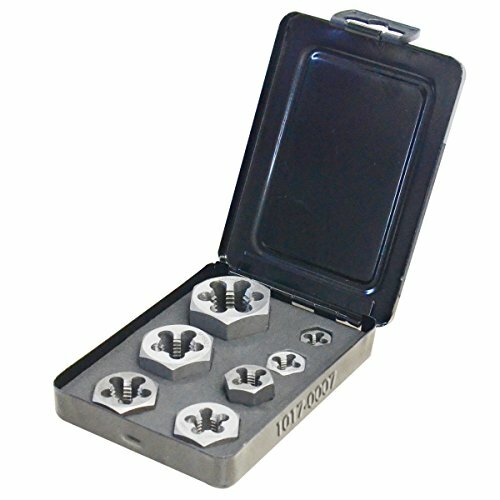 HHIP 7 Piece M6-M20 Hexagon rethreading die set includes one each of an M6 x 1.00, M8 x 1.25, M10 x 1.50, M12 x 1.75, M14 x 2.00, M16 x 2.00 and M20 x 2.50 die. Carbon Steel. Right hand. Supplied with fitted metal case. 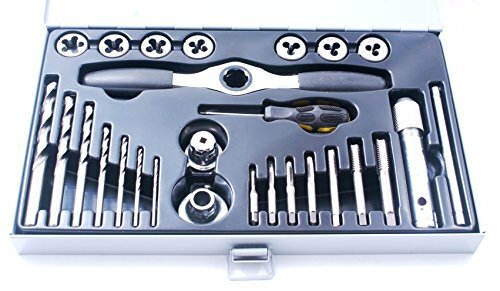 HHIP 27 Piece metric tap, die and drill set is ratcheting tap and die wrench. Locking tap adapter for larger taps. T-handle tap wrench for smaller taps. Fitted metal case. 25mm O.D. die adapter. High speed steel drills. Flat tip screwdriver. Ratcheting tap & die wrench. 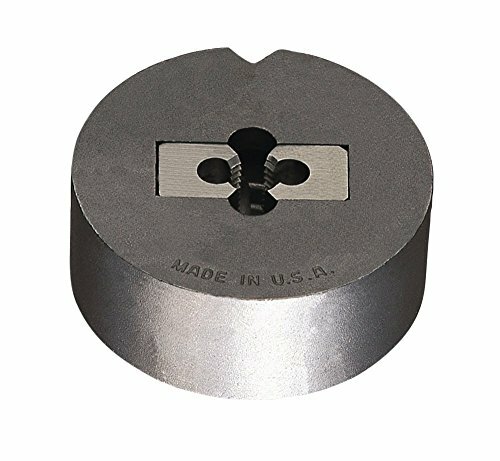 Tungsten steel taps & dies. Locking tap adapter for larger taps. T-handle tap wrench for smaller taps. 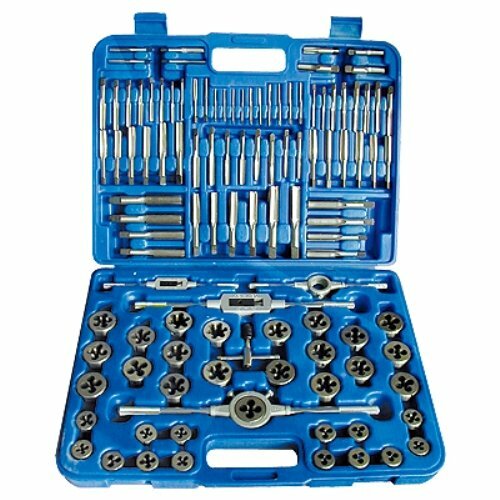 HHIP 110 Piece #4-3/4" and M6-18 Carbon steel tap and die set includes 1 taper tap, 1 bottoming tap and 1 die in each of these sizes 4-40, 6-32, 8-32, 10-24, 12-24, 10-32, 1/4-20, 1/4-24, 1/4-28, 1/4-40, 5/16-18, 5/16-24, 3/8-16, 3/8-24, 7/16-14, 7/16-20, 1/2-13, 1/2-20, 9/16-12, 9/16-18, 5/8-11, 5/8-18, 3/4-10, 3/4-16, 1/8-27NPT, 1/4-18NPT, M6 x 1.0, M8 x 1.25, M10 x 1.0, M10 x 1.5, M11 x 1.5, M12 x 1.25, M12 x 1.75, M14 x 1.25 and M18 x 1.5 die. SAE, NC, NF, and NS threads. Metric, international, and special. 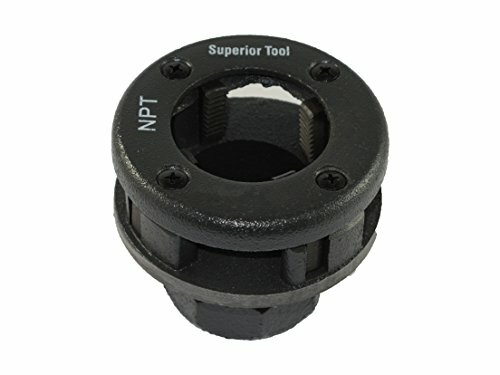 American National Pipe, NPT and NPS. 1" and 1-1/2" O.D. die stocks. No. 4 and No. 6 adjustable tap wrenches. T-handle tap wrench. SAE, NC, NF, & NS threads. American National Pipe, NPT & NPS. 1 & 1-1/2 O.D. die stocks. No. 4 & No. 6 adjustable tap wrenches. Application: general purpose. Die construction: two-piece die set complete assembly. Die style: two-piece die system. Hand of cut: right. Material: carbon steel. Measurement system: Imperial. Surface condition: bright. Tool size: 5/16-18 UNC. Collet size: #5. Outer diameter: 2-75 inch; outer diameter (metric): 63.50mm. Application: general purpose. Die construction: two-piece die set complete assembly. Die style: two-piece die system. Hand of cut: right. Material: carbon steel. Measurement system: Imperial. Surface condition: bright. Tool size: 1-8 UNC. Collet size: #5. Outer diameter: 2-75 inch; outer diameter (metric): 63.50mm. Application: general purpose. 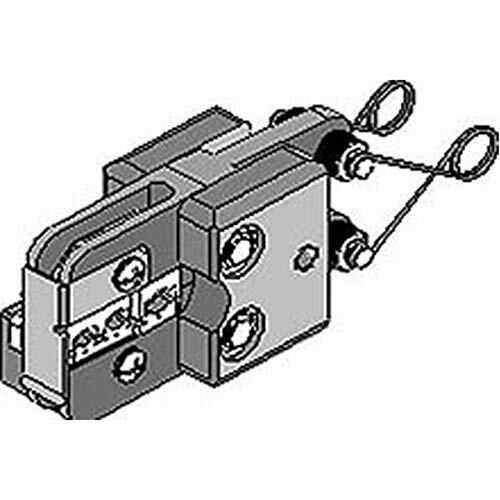 Die construction: two-piece die set complete assembly. Die style: two-piece die system. Hand of cut: right. Material: carbon steel. Measurement system: Imperial. Surface condition: bright. Tool size: #6-32 UNC. Collet size: a1 outer diameter: 1.2500-Inch, outer diameter (metric): 31.75mm. 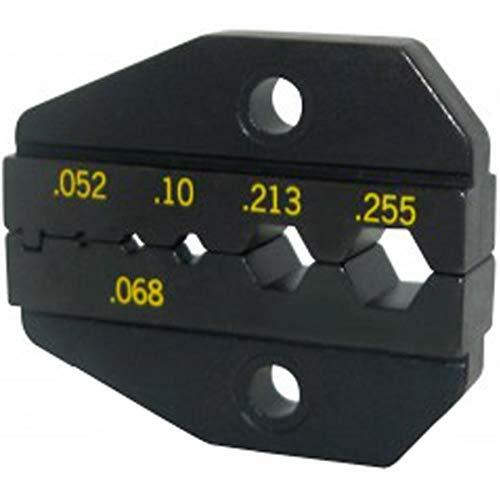 Plierfi0 Full cycle, compound leverage and triple ratcheted to give exact precision to every crimp connection. 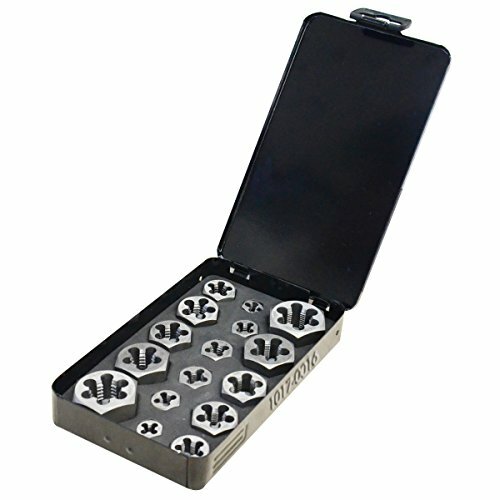 All the dies in the Crimpmaster Series are interchangeable. 30-506. 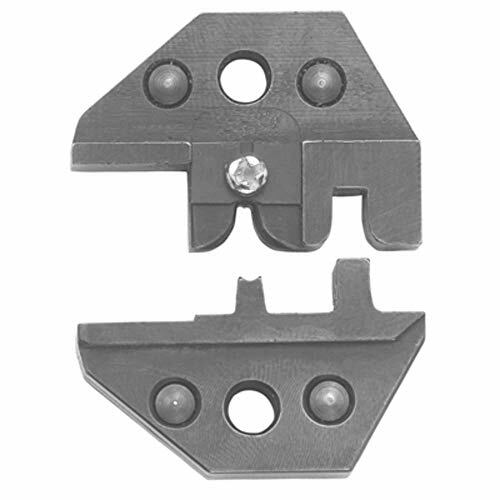 IDEAL Crimpmaster crimp tool frame.fi0Provides good and consistent crimp every time. Dies change quickly and easily with a screwdriver. Size -0.255 in., 0.213 in., 0.068 in. 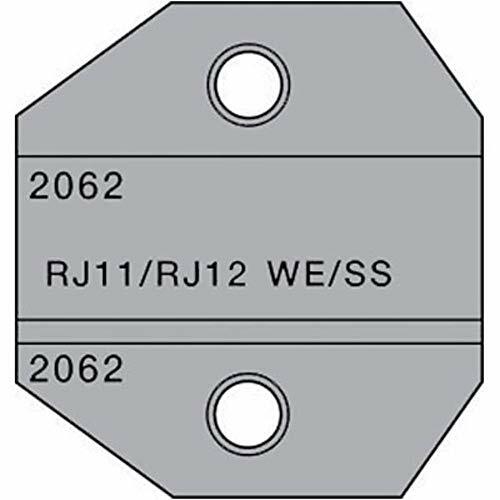 Universal Frame Die SetsHigh quality die sets for use with the universal crimp tool frame stock no. 848-391. 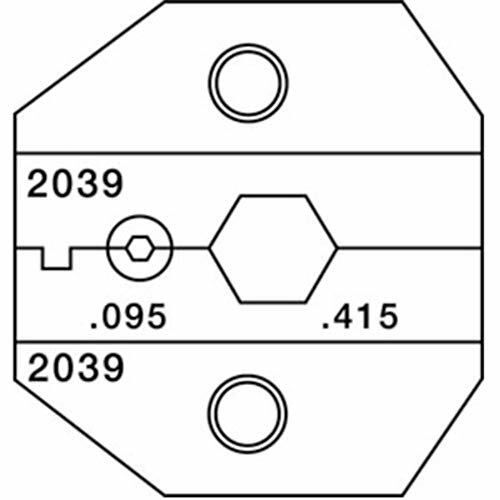 The die sets are identified with the appropriate cable group in the price table. The 146;Cable Group to Cable Type Relationship146; table lists the relevant cable types. 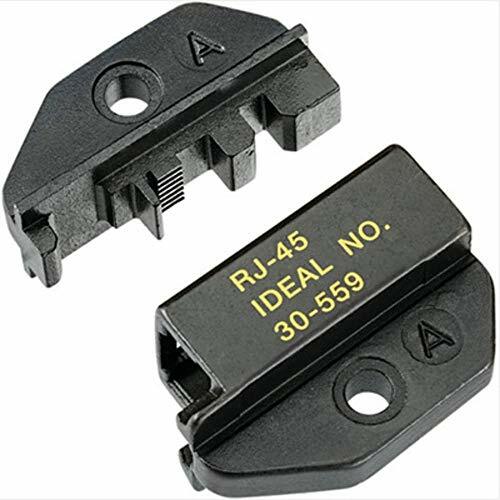 Connex 47 Series Coax Crimp Tools utilize industry standard crimp die set dimensions. 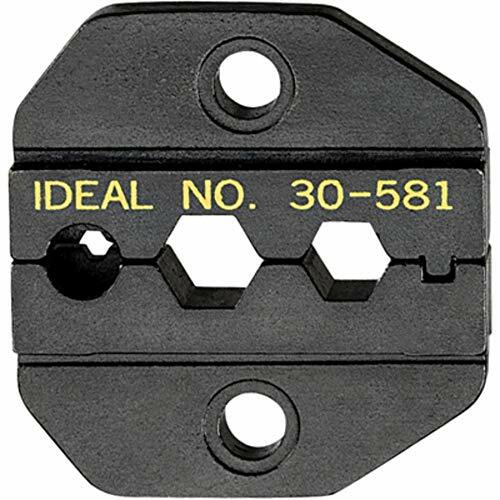 Tool handle can be purchased separately (47-10000) or with die set pre-installed. Die sets listed on datasheet will terminate all popular coaxial cables. Full ratchet crimp action ensures ferrules and contacts are fully crimped before tool releases. 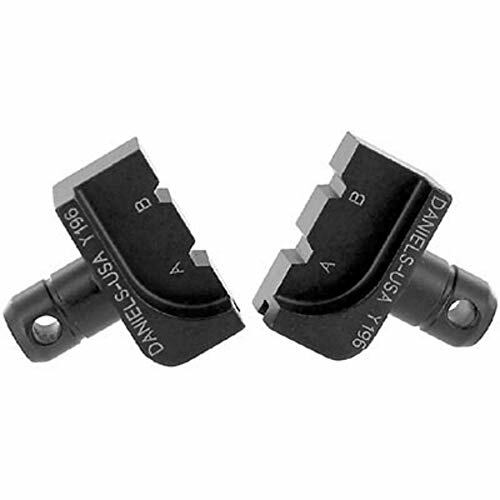 Die set for N-type, MS39012 Type coaxial connectors. 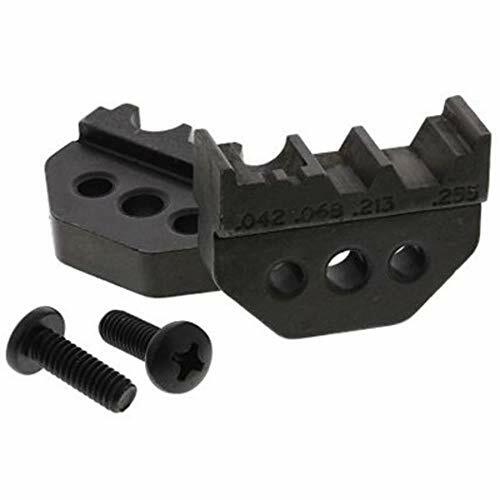 Fits both CrimpALL/8000 1300 Series frames"
Crimp die for use with Amphenol tool frame 227-944. Tool steel with 32 microinches (max.) black oxide coating per MIL-C-13924. Dies shall be supplied with appropriate roll pins.